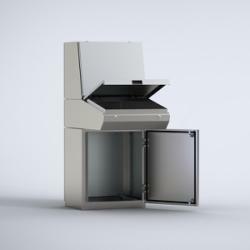 This stainless steel combinable console system, MPCS, has a IP 55/56 protection degree. It includes three interchangeable sections, top, desk and bottom. The system is very flexible and the various possible combinations can meet many design requirements. The ergonomic design of the top and desk units allows for easy installation and access to HMI-equipment, plus increases the mounting space available. This console can be installed in virtually any environment, grade dependent. AISI 304 pre-grained stainless steel / AISI 316L (on request). Body and door: 2 mm. Rear panel: 1.5 mm. Bottom plates: 1.5 mm. Mounting plate: 2.5 mm galvanized steel. Folded and seam welded. Console construction includes a base that provides a distance between the floor and the lower part of the door/s, acting as an integrated plinth. Single folded surface mounted with hinges, allowing left and right-hand opening to base door. Top section and desk panels held open by self engage/self release mechanical panel stays. Concealed hinges allowing 90° opening on the desk. Double doors on 1200 mm and 1600 mm wide base units. Standard in base unit. Fixed by fixing brackets on C rail, top and bottom for depth adjustment. Optional in desk and top section units. Double-bit 3 mm locks for top section and desk unit. For base, two double-bit 3 mm locks. Other options available. See wall mounting section. Bottom opening in base unit for cable access. Bottom plates for cable glanding supplied as standard. M8 threaded studs on bodies, doors and rear panels. Single door: IP 66 | TYPE 4X, 12, 13 | IK 10. Double door: IP 55 | TYPE 12, 13 | IK 10. The base unit is provided with a mounting plate as standard. Desk and top section units have mounting plates provided as accessories. All top and base apertures can be closed by choosing the appropriate accessory plate. Suitable nuts and washers for the various earthing studs are provided. Stainless steel combinable console, available in three separate sections, with a IP 55/66 protection degree. A flexible solution where customers can choose the console sections that meet size and design requirements, off the shelf, in order to create the console configuration required for their application. Each standalone console section will maintain the security and protection degree. Customers can receive consoles with a short delivery time, that match their size requirements. The ergonomic design of the top and desk unit, lets customers install and access HMI equipment easily, which increases the console's available mounting space. Component failure and unnecessary downtime is avoided as water and dust are prevented from entering the enclosure. Stainless steel consoles can be installed in almost any environment, grade dependent. Single door consoles have a IP66 protection degree whereas double door consoles have a IP 55 protection degree.